Video surveillance company CitiWatcher has implanted RFID chips in two of its employees. This is the first known case of workers being electronically tagged by their company. Radio Frequency Identification (RFID) is an automatic identification method, relying on storing and remotely retrieving data using devices called RFID tags or transponders. An RFID tag is a small object that can be attached to or incorporated into a product, animal, or person. These tags contain silicon chips and antennas to enable them to receive and respond to radio-frequency queries from an RFID transceiver. VeriChip, the company that manufacturers the technology, claim that around 70 people in the US have had the implants -- devices that have been approved by the FDA. CitiWatcher stated that it was testing the chips on volunteers as a way of controlling access to a room where it holds security video footage for government agencies and the police. Sean Darks, CEO of CityWatcher, likened the glass-encased chips to identity cards. They are planted in the upper right arm of the recipient, and read by a device similar to a cardreader. He says the chips do not pulse or emit a signal, nor do they have GPS capabilities. 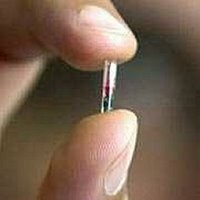 RFID implants in humans is controversial mainly due to privacy concerns. Tags: rfid, verichip, privacy, chip implants, bionics, bioethics.